When he first entered Walter Brown Arena in the Fall of 2003, Boston University goaltender John Curry was a virtual unknown – a recruited walk-on who was resigned to playing Division-III hockey just a few months earlier. Fast-forwarding to the present day, even Curry found it hard to believe that just 11 years after his arrival in Boston, he would be receiving an honorary red jacket from legendary head coach Jack Parker, as the netminder was elected to the Boston University Athletic Hall of Fame Saturday night. Curry, the seventh goalie to be named to the prestigious club, was elected in his first year of eligibility. While Curry left Commonwealth Avenue with the program’s all-time record in both goals-against average (2.07) and save percentage (.923), his road to BU hockey stardom was paved with both frustration and disappointment. Growing up in the small town of Shorewood, Minn., Curry got his first taste of discouragement when his favorite team, the Minnesota North Stars, moved down to Dallas when he was just nine years old. The young goaltender would soon turn his attention to the University of Minnesota Golden Gophers, where his dream of playing Division-I hockey was born. After an impressive high-school career at the Breck School in Golden Valley, Minn., led to no real opportunities with D-I programs, Curry attended the Taft School in Watertown, Conn., for one season, compiling a 1.46 GAA and a .920 save percentage. In the waning days of Taft’s season, Curry accepted the harsh reality that his goal of playing for a D-I hockey team was likely dead, and planned on signing with a D-III school in the coming weeks. However, Curry’s luck would quickly turn around, as BU’s then-associate head coach Brian Durocher scouted the goaltender and offered him a spot on the team as a walk-on. Serving as the third-string goalie during the 2003-04 season, Curry only saw five minutes of ice time during his freshman campaign. With the departure of Sean Fields at the end of the season, the starting goaltender job was up for grabs. Curry noted that while he obviously had his mind set on seizing the heralded position, his preparation did not change going into the new year. “Everything was still new for me. It was my second year, but you just take it day by day,” Curry said. “For me, I was just going in with the same mentality of just trying to be good in practice and be ready. I was fortunate enough to get an opportunity early in the year and the team played well in front of me and it went well for a while, which allowed me to gain some confidence and establish myself. After getting a start early in the season, Curry would never relinquish his spot, protecting the crease for the next three seasons. By the time he played his final game for the Terriers, Curry had led his team to three Beanpot titles, the 2006 Hockey East Championship and was a top-10 finalist for the Hobey Baker Award during his senior year in 2007. Despite forging an incredible legacy at BU, Curry was not drafted by an NHL team – instead signing with the Pittsburgh Penguins as a free agent on July 1, 2007. Assuming the role of undrafted free agent would aid Curry in his career, giving him a chip on his shoulder that he first gained while struggling to impress D-I schools during his high-school years. After four years with the Penguins organization, Curry played one season in Germany with the Hamburg Freezers of the Deutsche Eishockey Liga before returning to the United States to play for the Iowa Wild, the AHL affiliate of his hometown Minnesota Wild. The BU Athletic Hall of Fame boasts an impressive class of former Terriers – including players and coaches such as Mike Eruzione, Jim Craig, Chris Drury and Jack Parker. Joining them now is a former walk-on in Curry, who, after fighting for a chance his whole life, became a legend on the ice for the scarlet and white. The accolades keep coming for Jack Parker after his retirement, as he was named 2014 Hobey Baker Legend of Hockey Tuesday. Parker will be honored along with this year’s Hobey Baker Award winner at the Hobey Baker Banquet on May 29 in St. Paul, Minn.
Before Friday night’s game in Agganis Arena section 118, dozens of fans held up their own unique Garrett Noonan sign to honor the Boston University men’s hockey senior captain. Whether the signs said “State of the Noonan” or “A Noonan Hope,” they were all held high to support the Terriers’ leader on the night of celebration for him and his classmates. After the first period, that celebration shifted to the other end of the arena where former BU coach Jack Parker’s number was being retired and hung from the rafters. His number six hung over section 108 as the fans, as well as some prominent BU hockey alumni, chanted their thanks to the longtime bench boss. And finally, after the Terriers topped Northeastern University 4-1 to snap a nine-game winless streak, the celebration shifted to the BU locker room. It was the most eventful evening of the year for a team that has only won once since November. It was finally a night that the Terriers will want to remember. It started with the seniors, as forward Matt Ronan joined Noonan and MacGregor at center ice for the pregame ceremony (senior forward Jake Moscatel was honored last season while senior goaltender Anthony Moccia will be returning for another season at BU). None of them scored in the game, but each of them played strong defensively in holding the second-best offense in Hockey East to a single goal on sophomore goaltender Sean Maguire. The end of the game marked the final home game for a group of seniors that are a part of the transition period between BU coaches. It has been a tough final season for the trio, but winning on senior night had meaning for that crew. The program is going through that transition period now thanks to the retirement of Parker, who coached the senior class for their first three seasons at BU. It was a class that started with eight members, but as Charlie Coyle, Adam Clendening, Yasin Cissé, Matt Nieto and Sahir Gill all left the program for other levels of hockey, MacGregor, Noonan and Ronan are now the only three that remain. The strong performance along with the two celebrations overshadowed what was set to be viewed as a bad night for the BU hockey program, as several players were suspended by the team for events that Quinn called a “college decision.” However, even that worked in BU’s favor, according to Quinn. Whether it is remembered as the night Parker’s number was retired, the last night at Agganis for the three seniors or even the night BU snapped a losing streak without four of its key players taking the ice, Friday night was a memorable one for the Terriers. 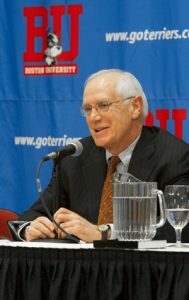 Following his number retirement ceremony during the first intermission of Boston University’s 4-1 win over Northeastern Friday night, former coach Jack Parker — never one short for words — met with the media to discuss the transition to retirement, the state of BU hockey and his relationship with David Quinn, among other topics. On having his number retiredObviously joining Travis Roy, I never thought that was a good idea, maybe a new coach would change it, but I never thought it was a good idea. I always wanted other people to wear the same number that somebody else who was a great player here [wore]. In our dressing room, in everybody’s locker we have whoever wore your number on the wall, so they know who wore their number before them. It was awful nice to have that happen. As I mentioned, and I think we’re not retiring a great player’s number, we’re retiring a guy who played here but also was a coach here for 40 years. The reason I was the coach her for 40 years was because I had so many great players. It’s as simple as that. On the transition to retirement and watching from a distance Actually, it’s a lot easier than I thought. I’ve turned the page pretty quickly, and I’m real close with David Quinn obviously, and I’m not around for him too much — I don’t want to be looking for his shoulder. We have a great relationship. We have lunch once a week but we don’t talk too much about hockey. We socialize. But I’m trying to stay away from the hockey. I come to the games with my grandchildren and watch the games, but I haven’t seen all the games, I’ve seen probably about one-third at home. And I’ve been away a lot. I did a few things for BU on road trips or functions. They wanted me out in L.A. and Dallas and San Fran and places like that. And I’ve also had the chance to take some winter vacations that I’ve never had a chance to do before. I’ve gotten into skiing a little bit. I just started taking lessons skiing, so I’m going to see if I like to do that if I can not kill myself. But in general I thought it’s been pretty easy. I’m really happy that the program’s in good hands with David, I’m really happy that they have a great recruiting class coming next year — the next two years actually — and I think that the program will jump back from this year very quickly. On the number retirement ceremony happening on senior night It was supposed to happen earlier and it got snowed out [Feb. 15], and I think it was even better that it was senior night, to see all these guys. Obviously I have a close relationship with all of them, especially the captains, so it was really nice. On which alumni were in attendance Mike Grier’s here, Jay Pandolfo’s here, Travis Roy’s here, Danny Ronan’s here, Matty Gilroy’s here, Marc Hetnik’s here, Jack O’Callahan’s here, Eddie Walsh is here. There are a few of them around. And there are other guys not in the [luxury] box, that are in the seats. On the significance of former players visiting as the program tries to rebuild I think it’s important for them to know what happened before, but that’s why they came here. I think it’s nice there was a big crowd here tonight. We haven’t drawn well lately. It was a real nice crowd here tonight, so I appreciate that, the fans showing up. It’s good for the players to see that and get the support they need. On if he’s surprised this year’s team has struggled Eh, I guess I’m surprised a little bit. I’m not immensely surprised because we got surprised by guys leaving that we didn’t think were going to be leaving, and a couple of them were real late leaves. We’d have a pretty good team if Charlie Coyle and Adam Clendening and Sahir Gill and Matt Nieto were still here. There all supposed to be seniors — that’d be a pretty good club right now. So losing those guys really hurt. Losing Nieto and Gill as late as we did really hurt. And we also lost a couple of others guys that left the program, so it’s a real thin team this year that we haven’t had to face before. It looked like it was going to be a good team coming back because we made it to the Hockey East final last year, we were third place in the league, we had a pretty good second-half run and looked like a pretty good hockey team. And now all of a sudden, guys started leaving. So that really hurt the program. The guys that are leaving are gone, and the guys that are coming in are great, so we’re in pretty good shape right after that. On the ovation for Travis Roy I always say, the worst that ever happened to me in 40 years of coaching the Boston University hockey team or my 49 years of being around the program was the injury to Travis Roy. And the best thing that ever happened to me was the way the BU community and the hockey community reacted to the injury to Travis Roy, how Travis and his family reacted to it. It was a tale of two cities. The worst of times and the best of times. And amazing how it worked out, how proud he’s made us of him. On whether David Quinn has asked him for advice Yeah, we talk a little bit. As I say, I’m not going down talking to him. My office is right down the hall from him, and if he wants to see me — if I’m there — if he wants to see me, he can come down and say hello. But we talk at least once or twice a week, but it’s not ‘You out to do this, David, or you out to do that.’ I kind of of let him vent about how he’s feeling and what’s going on. It’s been a hard year for him to go through. On whether or not he misses his old office Yeah, it was pretty nice. I have a nice one now too, but not quite as big. My brother said we could rent it out for functions. Due to the incoming snowstorm, Saturday’s Boston University-University of New Hampshire matchup will be played Monday at 4 p.m. The Jack Parker number retirement ceremony, which had been scheduled for the first intermission of Saturday’s game, will take place when BU hosts Northeastern University Friday, Feb. 28. That is also the last regular-season home game for the Terriers. Former Boston University men’s hockey coach Jack Parker has taken on a new title. USA Hockey announced Friday morning that Parker, who retired after working as the Terriers bench boss for 40 years in March, will work as the head coach of the 2013 U.S. Men’s Select Team that will participate in the Deutschland Cup in Munich, Germany. Ben Smith, who was an assistant coach at BU during the early 80s, and Mike Bavis, who spent 11 years as an assistant coach at BU before taking on the associate coach position from 2010-13, will serve as the associate coach and assistant coach of the team, respectively. The team will kick off the Deutschland Cup on Friday, Nov. 8 when it takes on Slovakia before playing Switzerland on Nov. 9 and Germany on Nov. 10. Jack Parker’s last season as the Boston University men’s hockey coach will be remembered for that reason alone. It will also be recalled as a hard season to figure: The Terriers, despite their youth, played a strong first half, a nearly perfect month of March wand a six-week stretch between those two that doomed their year. BU (21-16-2, 15-10-2 Hockey East) began the season dressing nine freshmen regularly. 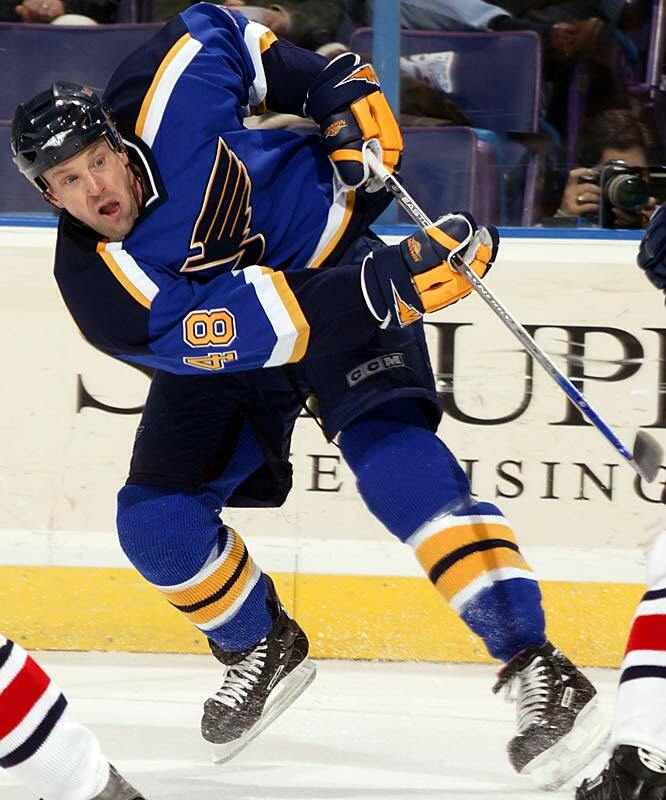 The team later lost center Wesley Myron to the ECHL, but nearly every other rookie made significant contributions in the end. With the amount of playing time they got, they had no other choice. Freshman Danny O’Regan proved himself a top-six center and led the team with 38 points. Freshman defenseman Matt Grzelcyk finished with 23 points, third among all Hockey East defensemen. In net, both freshmen Sean Maguire and Matt O’Connor played well enough to start alternating games all year, until O’Connor suffered a collapsed lung near the end of the season. Between the freshmen jumping in and older players, including Hohmann and senior captain Wade Megan, starting off hot, BU went 10-5 in the first semester against the nation’s toughest schedule. It faced Boston College and the University of New Hampshire three times and the University of North Dakota twice, beating each once. For more, including a look at why BU may have struggled so much in the middle of the season, go to dailyfreepress.com. Jack Parker sat quietly while his senior captain, Wade Megan, addressed the media after the 1-0 loss to the University of Massachusetts-Lowell in the Hockey East finals that ended Boston University’s season. When Megan said the Terriers had no regrets that night, though, Parker nodded, a gesture of gratitude to his team for the complete effort they gave in his final game. For 51 minutes on Saturday, BU (21-16-2) and Lowell (26-10-2) were locked in a 0-0 tie at TD Garden. Junior Derek Arnold scored the game’s only goal 11:09 into the third period. Lowell’s Connor Hellebuyck and BU freshman goalie Sean Maguire matched each other save for save for over 50 minutes, and Hellebuyck stopped 36 shots in all. Maguire finished with 28 saves. On the Lowell goal, Megan tripped and lost the puck near the Lowell blue line, springing the River Hawks on a 3-on-2. Senior defenseman Sean Escobedo drove Arnold away from the net on his initial chance, but Arnold came back around the net and flipped the puck over Maguire while he was down to make it 1-0. The Terriers opened the game with energy, outshooting UML 8-6 in the first period and establishing possession in the offensive zone much more consistently than they did the last two times they saw Lowell. Hellebuyck, however, was ready for every shot he saw, and the River Hawks blocked 21 more in the game before they ever reached him. Through two periods, BU led in shots, 26-21, but the momentum had begun shifting Lowell’s way. The Terriers opened the third on a power play but failed to earn quality chances. When the River Hawk in the box, Colin Wright, got out, he picked up the puck in the neutral zone and took off on a breakaway. He fired into the crossbar, and the puck came back out onto the ice through Maguire’s legs, a narrow miss. Lowell’s goal came about eight minutes later, and after it was 1-0, the River Hawks clamped down, limiting BU’s chances in the game’s final minutes. With Maguire pulled, the Terriers made one last push, but as Hellebuyck stopped a shot from sophomore center Cason Hohmann at the buzzer, they could not prolong Parker’s final postseason. Including last night, the Terriers went 7-2 in their last nine games. But the stretch between Dec. 29 and Feb. 23 did them in, in no small part because they lost a combined four times to Harvard University and Northeastern University – both of whom finished well south of .500 – in that span. Parker maintained, as he did after his last game at Agganis Arena on March 16, that he’d forgotten about his career drawing to a close until someone reminded him. An avowed Celtics fan, he took a walk around the Garden before the game to look at the basketball memorabilia on the upper floors. Parker finishes his career with 897 wins, including six Hockey East championships, but the graduating senior class leaves BU without a conference tournament win, a Beanpot win, or a national championship in its four years. Still, the 68-year-old found the bright side: he’s walking out on his own, with his health intact.